Bangalore : Somdev Devvarman on Friday said they have 50-50 chance of winning tomorrow's doubles rubber to put India on board after the hosts came a cropper in both the singles ties on the opening day of the Davis Cup World Group play-off tie against Serbia here. With veteran Leander Paes and Rohan Bopanna pairing up for the must-win doubles encounter, Somdev said everything now depends upon tomorrow's match. "The doubles may be 50-50, but we have really two good players (Paes and Bopanna). We feel like we have a chance, you know," he told reporters after India lost the opening two singles matches to trail 0-2 in tie. Somdev, who carried the onus of bringing India back into the tie after Yuki Bhambri's loss in the first singles match, failed to live up to the expectations as he lost the second singles 1-6 6-4 3-6 2-6 after battling for two hours and 23 minutes against Filip Krajinovic, ranked 37 places above him at 107. Somdev, however, said it would be extremely tough for India to make a comeback into the tie especially after going down 0-2 on the first day. "It is going to be extremely tough, especially after being down 0-2 against a very strong nation, and there is no question about that," he said. Nevertheless, Somdev hoped his teammates would come out firing in all cylinders tomorrow to give him and Yuki another chance in the reverse singles to turn the tables around. "Hopefully, the boys will come out fired up tomorrow and play some good tennis, and get us onboard. Thereafter, I will have another chance and may be I will be able to learn from the mistakes I made today," he said. Talking about his today's performance against Krajinovic, Somdev said bad serving did him. "Bad serving did for me, and made life tough for me," he said. Asked whether the Indians were comfortable playing in the higher altitude in contrast to the Serbs who gave an impression of worry, Somdev said: "Yes we had played well before in the altitude, but sometimes it works and sometimes it doesn't." "Also the team had a different approach to the game, especially when there was question mark over the participation of their top players - Novak Djokovic, Janko Tipsarevic and Victor Troicki," he said. 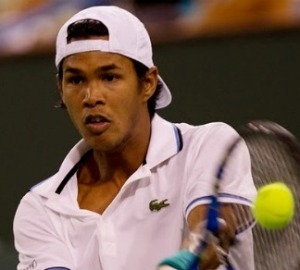 Somdev said he was disappointed with his game today and felt he could have played better. "Filip (Krajinovic) is an aggressive player and can play backhand and forehand shots," he said. "I was pretty disappointed with my game. I feel like I am a better player than I should have played. He is an aggressive player and can play his shots either ways - backhand and forehand. I wasn't surprised by his level of play. I was hoping I would play at higher level against (him) but unfortunately it didn't happen. "I was not really surprised by his game. He is a very good tennis player as well. There is no question about it. He was favourite to win the match," the ace Indian singles player added. Asked whether Yuki's defeat played on his mind while taking the court against Krajinovic, Somdev said, "Not for me. I came out and gave my best." Asked about his thoughts playing against Dusan Lajovic in the reverse singles, Somdev said it would be an interesting match because they play contrasting style of tennis.